Pavé white diamonds highlight the peaks and catch the light with every movement. A satin brush finish in the valleys and high shine on the ridges adds texture & lustre to these tactile, statement earrings. 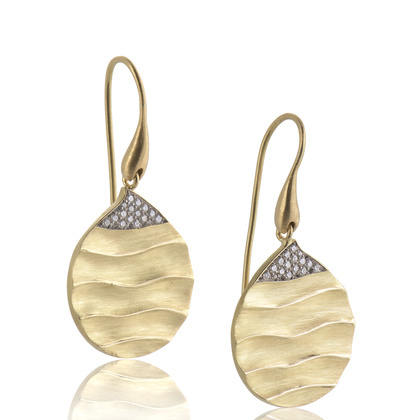 Casually chic, these golden drop earrings will add relaxed glamour to any occasion. 18ct gold. 32 pavé set 1.1mm white diamonds with 0.17 total carats. 20mm diameter. Drop length 35mm. Handmade in Hatton Garden, with love & great attention to detail, & hallmarked by the London Goldsmith's Assay office.